The old *72 scam has surfaced again, thanks to a group of cons in the Cook County Jail in Chicago. Twenty inmates made cold calls from the jail's phones pretending to be police officers, and managed to bilk clueless phone company customers out of $50,000 in free phone calls. 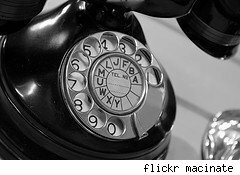 To understand the *72 scam, you must first remember that dialing *72 (1172 on old rotary phones) is how you forward your phone calls to another number. For example, to transfer your calls to the White House, you'd punch in *72-202-456-1414. Once you do, all calls, including collect calls, made to your number are forwarded on, but the charges show up on your bill. The cons apparently told the person answering the phone, the mark, that they were policemen, calling to tell them that a loved one had been injured in an accident. The con then instructed the person to call the cop on the scene directly by dialing *72, followed by the phone number of the con's accomplice on the outside. The accomplice no doubt answered the mark's frantic call by explaining that they were called by mistake, that all was well. If the mark doesn't tumble to this fraud, the accomplice is then free to use the phone number to accept collect and third party calls at will, all of which go onto the mark's tab. Only when the mark receives a huge bill will he/she have reason to call the phone company. Since some people don't look at their bills regularly, some phone numbers remain in play for months. The jail has altered its inmate-accessible phones to tag every call, at the start, with a warning that the call is from an inmate. What mystifies me is why inmates have such liberal phone access in the first place?